I want to start this post by stating how excited I am about the Coach-Speak concept. With the recent and explosive success of ‘The Players Tribune’ and how much that site has evolved my perspective, I’m confident this platform can serve a similar function. A few weeks ago, two of our assistant coaches had job interviews around the corner, so I sent an e-mail to our staff offering advice about the interview process. It’s interesting—there are so many situations in coaching that you’re just expected to handle properly and are held accountable for, yet you receive no formal teaching or training to help you navigate them. Interviewing for a job is one of those situations. The NBA’s D-League is an entry point into professional basketball not only for players, but for front office, coaches, medical, performance, operations, analytics, public relations, and officials as well. As a result, turnover tends to be both frequent and encouraged. In the three years since the Oklahoma City Thunder’s D-League affiliate, the Blue, has been in OKC, we have had nine staff members graduate from our program. Seven of those nine moved on to jobs with NBA teams; including four who were promoted internally with the Thunder organization. With a couple of you guys interviewing for jobs next week, I wanted to pass along some advice for the process. If I can help beyond this, let me know. Take the time to evaluate where you’re at in your career. Become an expert on yourself: what you’re about, where you’ve had successes, where you can improve, what vision you have for yourself in the future. This may not be directly communicated in an interview, but will help you communicate more clearly as these topics are likely going to be covered in just about every interview process. Look at the job and look at yourself. What criteria would give you the best chance to be offered the job? Answer this question… If they’re looking for someone who ________________, then they will offer me the job. That’s what to focus on when talking about what you’re about and what strengths you bring to the table. The more vague and ambiguous you are with your strengths, the less people will gravitate to them. Choose the strengths you have that differentiates you from others and double down on them. Be honest about your weaknesses and how this job would help you address them. This is powerful in a number of ways: First of all, transparency builds trust. The more honest you are, the more they’re likely to trust you. Second, being open about your weaknesses is a sign of self-awareness and emotional intelligence, which are (no doubt) considerations when making a hire. Third, explaining how this job would help to address your weaknesses gives them confidence that you (a) believe you can improve and (b) want help in the process of improving, which gives them a sense of ownership. Finally, honesty about your weaknesses sets a realistic expectation in the case that you do get the job. If you pursue the job with a sole focus on strengths and you get the job, eventually, your weaknesses will come to light and could catch them off guard. Being honest on the front end will set an expectation that you can exceed if/when you actually begin working there. Know the organization and the key stakeholders. In the case of an NBA team, learn about the owner, general manager, head coach, roster, and organization as a whole. Also, try to find out who you’ll be meeting with on the interview and do a deep dive into understanding who they are and where they’ve come from. It’s always impressive when you interview someone who’s done their homework. It communicates an enthusiasm for the job and reveals preparation. Try to find someone who currently works in the organization, who has previously worked in the organization, or with key stakeholders in the organization. Try to get a look behind the curtain. It will help you to contextualize what you see and hear on the interview and will help you to gauge whether or not this is a job you want to accept if offered. Questions express interest and engagement. Ask questions to better understand the mission of the organization, the vision they have for your job, and about the job itself. They want to hire someone who will be excited about the opportunity. They don’t want to feel like you’re doing them a favor by working there. They want someone as excited as they are about the organization’s success. At the same time, communicate contentment with your current job. They want someone who is excited about the opportunity they can provide rather than someone that’s running away from their current job. When I interview candidates, it is a red flag when someone seems eager to get out of their current job. It begs the question, “if I hire this person, are they going to get bored with their job in a year and want to move again?” They want to hire a fully committed employee. It’s typical for the negotiation portion of the process to occur after a round of interviews and once an offer is set to be made. When a candidate brings up money, it’s a red flag in that you are left to wonder if the person is motivated by the opportunity itself or the external benefits that the job can provide. Again, they want to hire a fully committed employee. 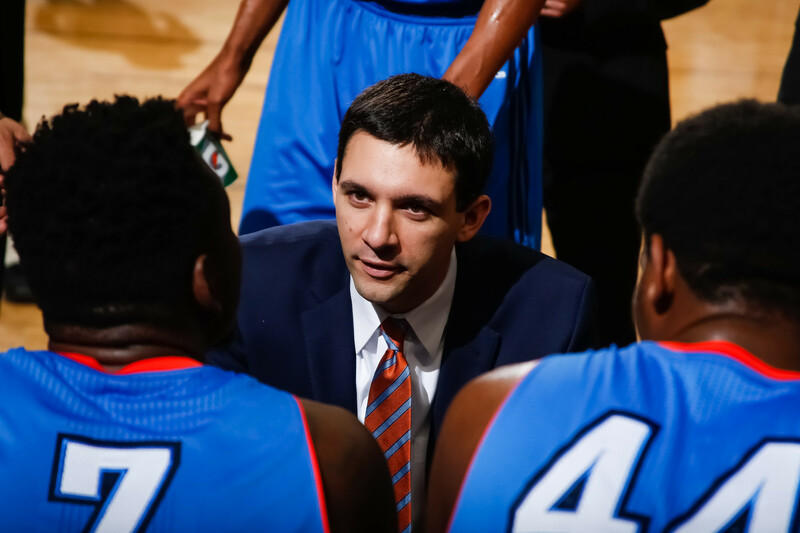 Mark Daigneault is the Head Coach of the Oklahoma City Blue of the NBA’s G League and one of the brightest young minds in all of basketball. After 3 seasons as an assistant coach at Holy Cross Mark served on Billy Donovan’s staff at the University of Florida for 4 yrs. He then joined the Oklahoma City Thunder Organization in 2014 and is now charged with leading their GLeague Affiliate the OKC Blue. He is a future NBA head coach. You heard it here first!